We would start this day in Queenstown, where we have the whole morning to choose an adventure, then, in two hours we will be in Te Anau, where starts the road to the most famous fiord in the Southern Hemisphere: Milford Sound. This is the Milford Road and is a must-do by itself as its 120 Km are full of places of interest. The highlights are The Chasm and the Mirror Lakes. We want to spend the night as close as possible to Milford Sound to be able of be on board of the first cruise of the next day, when the coaches full of tourists still haven’t arrived. Route on map is 290 Km, which should be covered in 3 hours and a half . We start early, as usual, and at 8 AM, just after taking away a cup of hot chocolate with a couple of marshmallows on it, we’re walking around empty Wanaka town. We need some things but everything is closed: i-site, which is on the lake shore, opens at 9:30 AM, so I will have to book the Milford Sound cruise for tomorrow in Queenstown. Shops and bank will open in one hour, so I just can take some cash off from the ATM. My idea is being back to our route plan today and, therefore, tomorrow we will be where we should be, that’s why I can book the cruise now. What is going to allow this time recovery is, on one hand, reaching Wanaka yesterday, just a few hours from where we were supposed to be and, on another hand, this morning, which was supposed to be spent on adventure activities in Queenstown but, due to the higher rates, the only activity for today is a bungy jump from the youngest of our group. So we’re going to drive to Te Anau and take the Milford Road this afternoon as scheduled. Wanaka town is built around the shore of the lake in its very Southern side and it looks clean and cared, like all the towns here. The lake side is like a park, with grass and beautiful trees. Around 9 AM we take the road to driving to Queenstown but, before, we get our motorhome’s tanks full of Diesel at 1.729$ per liter. Road is pretty scenic and the first part of it goes through the mountains and getting closer of their snowed tops. Actually, we pass by the junction to Cardrona, the most popular ski field around, which road is marked as a “chains needed” one. The entire road to here is looking different than the rest we’ve passed by in this country with hills covered by brown shrub where there was not snow. It is recalling the Pelenor fields in “The Return of the King”, which filming location is around here. The temperature outside is reaching its minimum in the driver panel of our motorhomes: 2º. From there, the rest of the way to Queenstown goes down to the valley where it is located. At 10 AM we’re getting into Queenstown, which is looking as a city full of live. As in all cities in New Zealand, buildings are low, like if everybody in this country is living in houses, out of the concept of “flat”. We’re shocked by the lack of traffic lights in the city center: every crossroad has a small circle in the middle creating a roundabout instead. It’s hard finding parking place for these big motorhomes we’re driving and is finally in a pay & display side of the street where we leave our vehicles. We get a one hour ticket by 2$ for each one, although they’re taking two spaces. The highlights of this city, apart from the activities, are its beautiful lake and the Gondola, a steeper cable car taking to the top of a hill where we guess the views must be stunning. We’ve seen the i-site before when driving around and we’re going to there. It’s time for exploring the city, but for closing some pending issues too. For example, just before going to Wellington, the board doing as table by day, but closing the U shaped sofa to make a big bed, got broken. Since then one we can only use half of that bed. The problem for fixing that in Wellington was it was a weekend and nobody works and, since then, we haven’t been in a city at working time… until now. When I call to Apollo I’ve got an address in Queenstown where that problem can be fixed. a) We book and pay the bungy jump for our girl. At 12:30 PM we must be at Karawau Bridge, marked in the map they give to us. It’s 180$. b) We don’t need to book Milford Sound cruise if we’re going to take the first one at 9 AM as, at that time, there are so few people that you can purchase it directly in there just some minutes before. But we’re told about the possibility of having to use chains when driving to there. c) We’re given a city map where is marked hot to go to the garage which address I’ve just written. With all this, we’re going to use the time with paid parking to exploring the city, until 11 AM, when we’ll go to the garage. From there, we will leave this city to be in Karawau Bridge, which is like 15 minutes away, on time for the buggy jump. And we do so: after some shopping we go to the garage, where they take the broken board and tell us in 45 minutes we will have the fix ready. 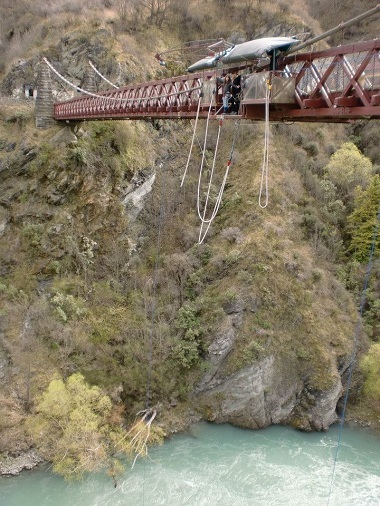 Then, our convoy goes directly to the bungy jumping. We look for Kawarau River, which we find in 15 minutes and, when the views open and let us see the bridge, our breath stops to each one of us. The views are great, but it is looking high, too high over the river. 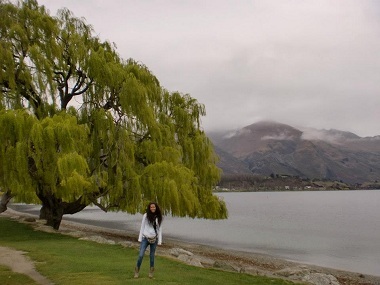 This is the location for the Argonath scene in “The Lord of the rings” too, although those colossal statues of kings raising their hand in sign of stop were digitally added, of course. The entrance to the bungy jumping place is at the top of a building and a spiral ramp around the walls leave visitors at floor, between dynamical displays and music. Procedures are easy: the girl is weighed, written her weight on her hand and address her outside. There is a lookout area for family and friends and the bridge, quite impressive, over River Karawau. Here is where bungy jumping was born, this big business where people is coming, one after the other, for an activity which takes just a few seconds and almost no expenses but each person is paying 120€. Someone is rubbing his hands together somewhere as he wonders how is it possible his balance is getting higher and higher, no matter how many money he is spending. A couple of guys help her to wear a harness, her ankles are tied together with a towel and she is ready. Everything happens too fast but I will always remember the shudder of her mother when she jumps. At least the environment is the best. We come back to Queenstown, but just one motorhome. The other two will wait in Frankton for our return with a complete bed. It doesn't take long as it is just arriving there, putting the board and coming back. 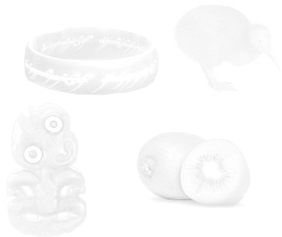 So we take the road to Te Anau with the idea of lunching in some beautiful place there. It is a two hours trip, but we've already learned to be faster. The first part of the ride is in motorway 6, along Wakatipu Lake, which is the same lake in Queenstown, only it is quite long. Then we take 94 to Te Anau, through green hills full of... - of course - sheep. We stop in Te Anau as we need to buy some food and we see a supermarket with plenty of parking space. Then we get full of diesel again because the next is 4 kilometers (2 kilometers of distance for a return trip) with no gas stations and because it is a bit cheaper than the one this morning. We leave Te Anau at 4 PM without lunching because we're expecting to find a beautiful place to do a picnic with what we cooked yesterday along the Milford Road. The road is following the side of Te Anau Lake and when a picnic area with toilettes sign appears we follow it until a place in the forest and in the shore of the lake. I get the picture at right here as prove of my happiness for lunching finally. After that, we follow the Milford Road with the sun, again, as our only clock. The entrance to the falls we chosen as first stop is closed, so we go on until Mirror Lakes. Once there, we have a wooden balcony for us, but these waters are not in their best now. Clouds are hiding the top of the mountains, which we know are snowed, avoiding appearing in the reflection on the lake surface, which is not clear because the water is not quiet. 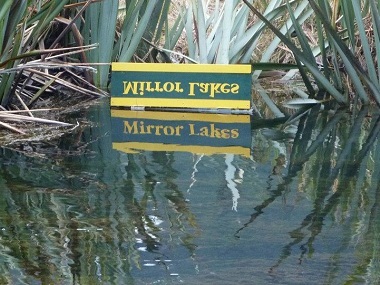 The result is quite poorer mirror then the one we saw in Lake Matheson. Our duties for today are done, we just have to drive until the spot I've got marked in the map as the last area allowed for camping. This is a National Park, Fiordland, and free camping is forbidden. They have set several areas with toilets and car park to do it. We end in a riverbed, in front of the snowed mountains and we use the toilets before the light is completely gone. I expected a lot of sandflies in this area, but we haven't got any news from them since our first experience in Marahau Beach. And the weather keeps being always good. Are we really in New Zealand?